Find hotel near The Martyrs' Memorial And .. 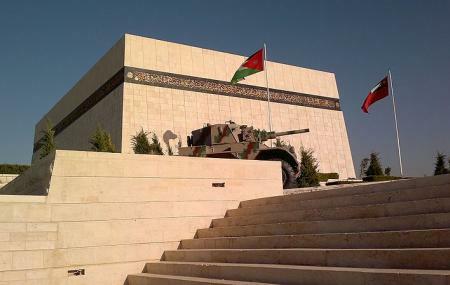 This is a simple museum that follows Jordan's history in the 20th century, focusing on military history from the Arabian Revolt in 1916 to the Arab-Israeli wars. Documents, weapons, clothing and vehicles make up the bulk of the collection here. There are also Turkish uniforms, British radio equipment, arms from the USA, and camel saddles. However, it is meant to serve more as a commemoration of martyrs rather than a particular narrative. As such the structure itself is a featureless building of white stone with one single black band inscribed with words from the Quran. There is also some focus on the development of Jordan’s armed forces. Visiting this museum intimately imparts the Jordanian view of the Ottomans as state enemies. How popular is The Martyrs' Memorial And Museum? People normally club together Habibah Sweets and Rujm Al Malfouf while planning their visit to The Martyrs' Memorial And Museum. I was on a trip to Amman with the children, memorial is a good place to visit to see the Jordan in the making history and a high place to see the city. Next to it is a jogging track and cycling area( bicycles are available on rent for 2.5 and 3.5 JD for Normal and Sports bicycles respectively of all sizes for an hour.